South Sudan’s political culture, including its current civil war, is international. This is due to the country’s history of mass migration and displacement, particularly during the last two civil wars from the early 1960s. By the end of the last century, approximately four million of its roughly ten million estimated residents had fled across South Sudan’s borders. Although many regional refugees returned to South Sudan following the CPA in 2005 and independence in 2011, the renewed conflict that began in December 2013 and was reignited in the centre of Juba in July 2016, has forced at least 1.5 million residents to flee once more. As such, every community across South Sudan is part of a regional and global network. Many politicians, NGO workers, businesspeople and civil servants are themselves returnees or dual nationals. South Sudan’s communities and families have long moved money and goods through international and internal networks. Today, however, as the current civil war spreads and fragments, this transnational network is under significant stress. South Sudan’s refugee communities have, and have always had, considerable influence on the way that the country’s civil wars evolve. 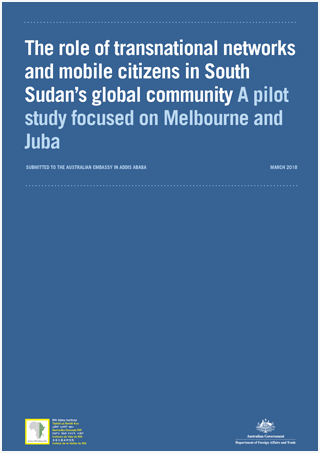 In this study, through research undertaken both in South Sudan and in one of the most active global South Sudanese communities in Australia, the team has attempted to take a broader perspective to understand the nature of this impact—and the mechanisms through which it is felt—more comprehensively. The report was written by Cedric Barnes, Freddie Carver, Santino Atem Deng, Gabriel Kiir, Nicki Kindersley, Rebecca Lorins and Sarah Maher.